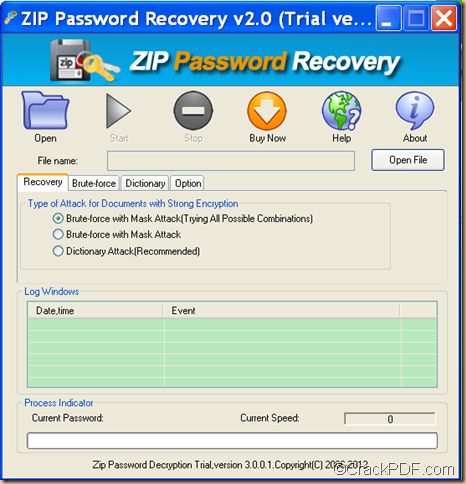 This article is mainly about how to use CrackPDF ZIP Password Recovery to recover password for ZIP/WinZIP/PKZIP archives. ZIP is a file format used for data compression and archiving. A ZIP file contains one or more compressed files to reduce file size. The format was originally created in 1989 by Phil Katz, and was first implemented in PKWARE’s PKZIP utility. It is now supported by many software utilities other than PKZIP. 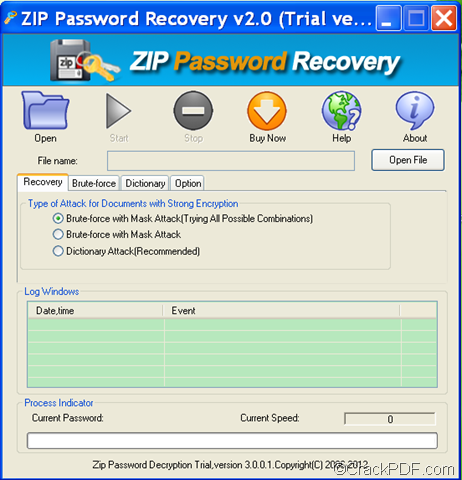 Please download the installer of CrackPDF ZIP Password Recovery and install it on the computer by double clicking the installer. Then, please follow the setup wizard to finish the installation. After opening the application, you will see the user interface shown as the following snapshot. Please click the Open button in the tool bar or the Open File button beside the “File name” input box to add the ZIP file into the application. If you remember something of the ZIP password, please check the radio button of “Brute-force with Mask Attack” in the “Type of Attack for Documents with Strong Encryption” group box. Then, please click the Brute-force tab beside the “Recovery” tab. In the “Brute-force” panel, you can set some parameters to narrow down the password combinations. If you remember nothing about the password of the ZIP file, please check the radio button of “Dictionary Attack (Recommended)” in the “Type of Attack for Documents with Strong Encryption” group box. Then, please click the Dictionary tab and make the corresponding settings. If the above two fail, then you can resort to Brute-force with Mask Attack (Trying all Possible Combinations). At last, please click the Start button in the tool bar on top of the panel to start to recover the ZIP password. This is the end of this article and you can click the following button to free download CrackPDF ZIP Password Recovery.